110-120V requires a 20amp circuit. 220-240V requires a 20amp circuit. Closed door filtered air drying ensures wet packs and pouches dry withoutcompromising sterility of instruments by airborne contaminants. Variable timed drying cycle saves time by giving operator the flexibility to set drying time according to load size. 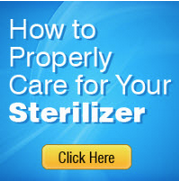 One custom and four automatic preprogrammed sterilization settings allow you to select the appropriate cycle according to type of load.